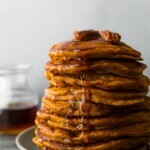 The BEST pumpkin pancakes recipe that is tender, fluffy, and tastes just like fall! With delicious pumpkin flavor and cinnamon, nutmeg and ginger, these are loved by both grown ups and kids! It has been far too long since I shared a pancakes recipe with you! In fact, that really needs to change. While we love plain pancakes loaded up with fresh berries, yogurt and maple syrup, there is just something extra fun about flavored panakces! I smell a 7 flavors post…what do you think? 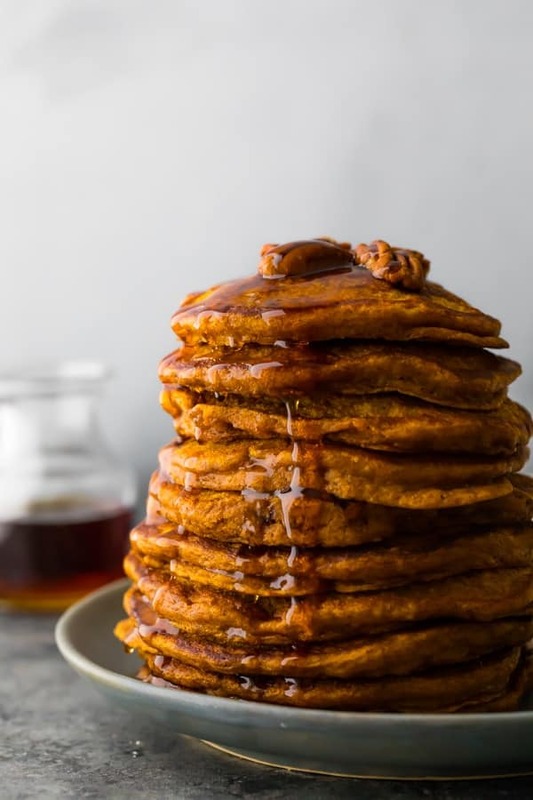 Starting off with this delicious pumpkin pancakes recipe, which are fluffy and taste just like fall: pumpkin, cinnamon, nutmeg and ginger! Then stir your wet ingredients all together. You can return the bowl to the microwave for 20 second increments if your coconut oil begins to solidify. Enjoy with pecans and maple syrup! 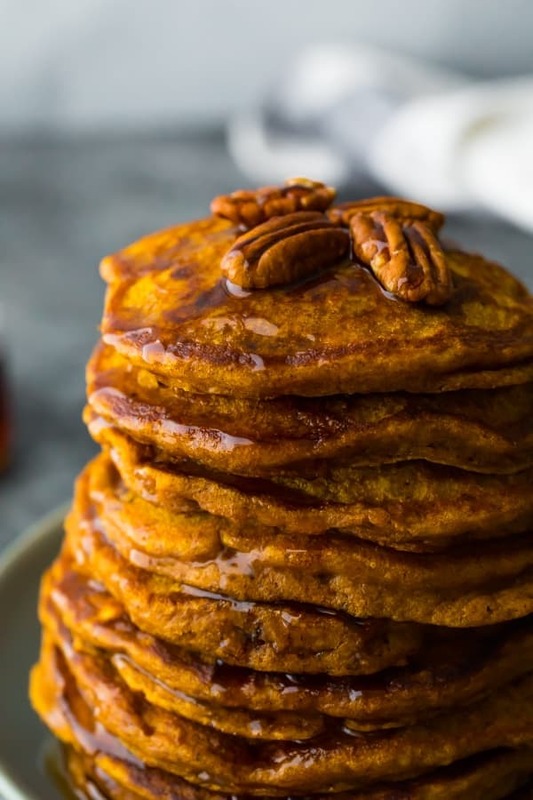 Can this pumpkin pancake recipe be made ahead? YES! We love making a double batch and storing the leftovers in the fridge. When we want to re-heat, we just pop them in the toaster! You can also make them ahead and freeze for up to 3 months. Make sure you wrap them in a layer of cling wrap and place in a storage container to avoid freezer burn. 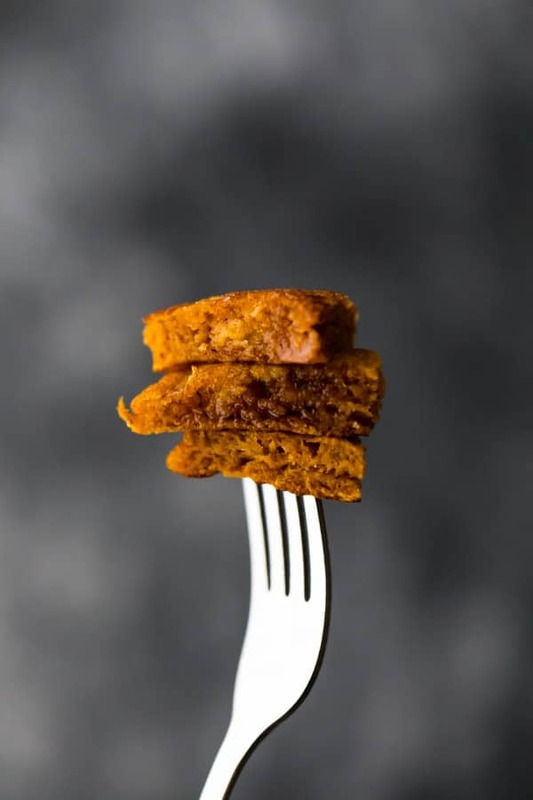 Can I swap the all purpose flour for whole wheat flour for these healthy pumpkin pancakes? Almond flour? XYZ flour? I have only tested these pancakes with all purpose flour. I suspect they would work well with whole wheat flour. I haven’t tested almond or any other alternative flour. 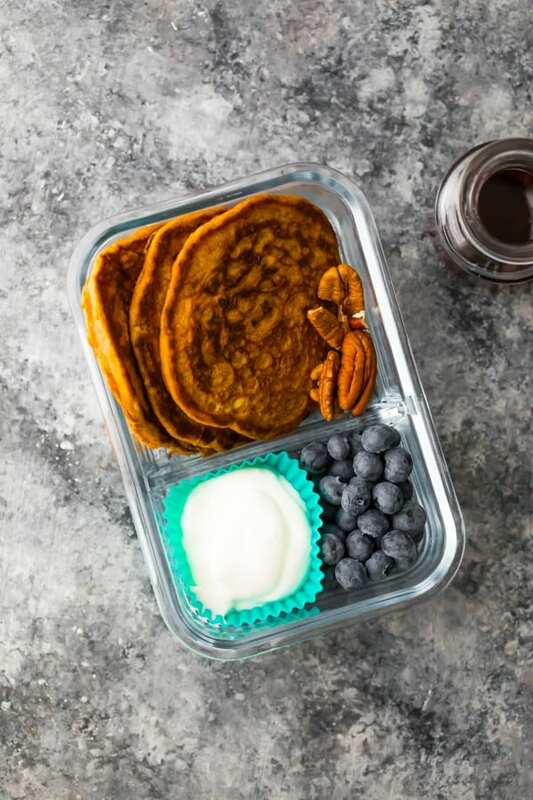 Can I bake these healthy pumpkin pancakes in the oven? Good question! I have a sheet pan pancakes recipe here, but don’t know if this pumpkin pancakes recipe would work in the oven. Looking for more pancakes? Check out these Extra Fluffy Blueberry Almond Pancakes or these Coconut Chocolate Rice Krispie Pancakes! And you can find 10 Time Saving Breakfast Recipes here! In a large microwave safe measuring cup (like this one), melt the coconut oil. 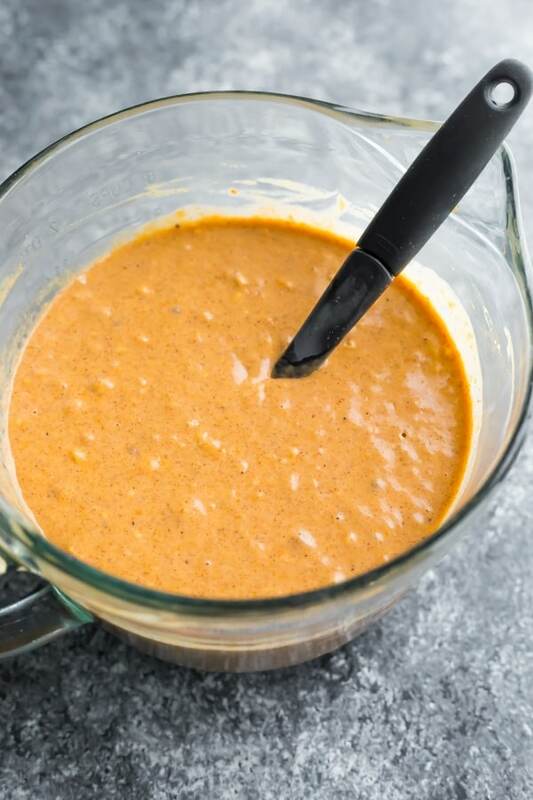 Stir in the pumpkin puree, eggs and maple syrup until smooth. If coconut oil begins to solidify, pop it back into the microwave for a few 20 second increments. Stir in the milk and vanilla. Set aside. In a separate bowl, mix together the flour, baking powder, baking soda, cinnamon, ginger and nutmeg until completely combined. Add the dry ingredients in with the wet and stir until the batter is smooth and no pockets of flour remain. These look so wonderful! Hope they’re a hit with my son…My son is on the GAPS diet, can I possibly substitute the Flour, Maple Syrup and Milk for gaps appropriate ingredients? Hi Jess! Sorry if these swaps are not allowed on GAPS, I”m not familiar with the restrictions! Milk- you could use almond milk, maple syrup, you can use honey and probably sugar but I haven’t tested. And the flour I unfortunately really can’t say for sure without further testing. I don’t have coconut oil in the house…can I substitute another type of oil? Hi Jen! Sorry for my late reply. You can use vegetable oil if you have that on hand! I am definitely going to do a 7 flavors post, however it might take me 6 months to get them all out 😀 Thanks, Emma!